Taijiquan (often written in the West as "Tai Chi Chuan" or just "Tai Chi") is an old and profound Chinese martial art system that is practised by millions of people worldwide because of it's tremendous health benefits. When the routines are practised as gentle slow motion exercise it is physically suitable for nearly everyone, although not everyone has the self discipline to make real progress. It is a complex art with many levels to it. Regular practise and correct instruction helps the body to let go of tension and trains the mind to become calmer and much more focused. For hundreds of years it has been well known to increase health & vitality, improve concentration & focus, boost the immune system and ward off illness. The soft, rhythmic, circular movements of its slow practise routines gently massage the internal organs, assist the lymphatic flow, align the skeleton, and increase circulation to every cell in the body; which over time, can bring robust health. Many people nowadays practise Taijiquan form (solo movement routine) just for its health benefits and philosophical insight. The art has been well documented throughout history for its ability to aid healing and prevent illness by boosting the immune system. From Taijiquan one can choose what they want to achieve from improved health and meditation to 'internal' martial arts. "Taiji" is the name given to the philosophy of the interaction between Yin and Yang (the opposite yet mutually supportive forces of everything in nature and the universe). "Taijiquan" is the name of the exercise system that we practise. "quan" (chuan) means fist, or in this context, means martial art style. Many people regard Taijiquan as slow relaxed movement for health and well-being, but it is also a combination of martial techniques, breath control, rich philosophy and moving meditation. At a basic level, the movements are performed in a slow relaxed manner, they are suitable for everyone regardless of age or fitness level. 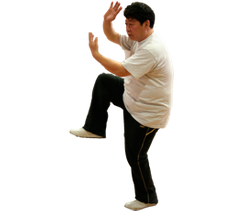 However, for more able-bodied students, Chen style also contains fast dynamic movements, called ‘Fa Jin’ or ‘energy release’ - bursts of power for striking, long and short range. However these can be also practised at a more casual pace depending on the students physical abilities. The idea is to link all the body parts together through slow careful practise so that the body can move as one whole unit - real Tai Chi is never just "waving your arms around", it is about learning to transfer energy (movement) through every part of the body like a whip. This transfer of energy can then be applied to different techniques. The first task is to learn to relax and "open" the joints. For those that want to, the "Erlu" (second routine), nicknamed "Cannon Fist" can also be taught along with traditional weapons forms and hand to hand combat application. However, most people find they have more than enough on their plate just learning the first routine. The earliest mentions of Tai Chi philosophy are around 5000 years ago when the "Book of Changes" (I Ching or Yi Jing) was written. This described the interaction of yin and yang and its relation to all things in nature and the universe. It is widely accepted and historically verifiable that what is nowadays known as Taijiquan or Tai Chi (the martial art system), began around 400 years ago in Henan Province with Chen Wang Ting (陈王庭 1580 - 1660), Ninth generation of the Chen Family, when he retired to Chenjiagou (Chen family village). He was a seasoned, battle-hardened General at the end of the Ming dynasty and start of the Qing dynasty. In his retirement he combined his vast knowledge of martial arts with Chinese Medicine theories, and a profound understanding of natural laws and Yin/Yang philosophy. The family style took their name and much later became known as Chen style Taijiquan. Chen style is the original and most complete system, because, as the Taijiquan family tree spread across China, a lot of knowledge was lost within the other styles (Yang, Wu, Woo, Sun styles). Chen style perfectly embodies the yin & yang theory with its use of both slow and fast, soft and hard, high and low movements as well as its characteristic twining and coiling techniques. 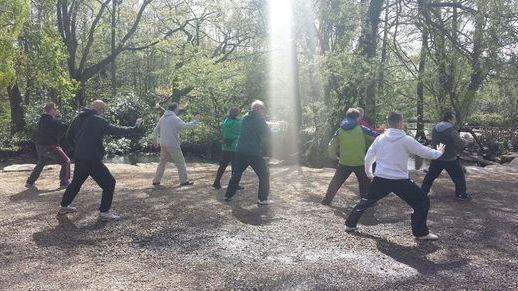 Practising Tai Chi form - not as easy as it may look! All styles of Chinese martial art have solo practice sequences known as "forms" that contain the techniques of the style. Nowadays, it has become popular for people to practice in groups, although greater progress can be made by oneself. In Taijiquan the forms are practiced regularly in order to develop the attributes required to progress one's skill level. The level of detail beginners learn is just the tip of the iceberg as the art is infinite in its depth. A common misconception is that Taijiquan is the 'easy' answer to exercise. This could not be further from the truth. Most beginning students find out very quickly that it is extremely physically challenging, very complex and difficult to co-ordinate correctly. Some measure of dedication and regular practice is required to make any real progress in this art. A student starts learning with large extended movements and the focus is on correct posture, alignment and smooth transitions that abide by the core method. As a person progresses, the circles generated from their body become gradually smaller, subtler and more internal. At an advanced level, these circles become very small, sometimes almost undetectable. This is why each persons Taiji form looks slightly different. We are all at different levels of ability. Whilst the techniques may have the same template, it is how the movements are generated, controlled and expressed that separates the level of the students. As a beginner, one should breathe naturally during form practice and not try to force the breath to fit the postures. In the beginning, the movements themselves are enough to contend with... Taijiquan can be practiced at different speeds depending on training goals. If you practice very slowly you will need more breaths for a movement than if your movements are quicker. However, over time, and as the movements become part of you, you will develop a deeper 'body-intuition' and the correct breathing patterns will be taught and integrated with ones movements, to create a smooth & efficient way of executing the techniques, with the internal driving the external. "A growing body of carefully conducted research is building a compelling case for tai chi as an adjunct to standard medical treatment for the prevention and rehabilitation of many conditions commonly associated with age," - Peter M. Wayne, assistant professor of medicine at Harvard Medical School. Low bone density. A review of six controlled studies by Dr. Wayne and other Harvard researchers indicates that tai chi may be a safe and effective way to maintain bone density in postmenopausal women. A controlled study of tai chi in women with osteopenia (diminished bone density not as severe as osteoporosis) is under way at the Osher Research Center and Boston's Beth Israel Deaconess Medical Center. Heart failure. In a 30-person pilot study at Harvard Medical School, 12 weeks of tai chi improved participants' ability to walk and quality of life. It also reduced blood levels of B-type natriuretic protein, an indicator of heart failure. A 150-patient controlled trial is under way. Hypertension. In a review of 26 studies in English or Chinese published in Preventive Cardiology (Spring 2008), Dr. Yeh reported that in 85% of trials, tai chi lowered blood pressure; with improvements ranging from 3 to 32 mm Hg in systolic pressure and from 2 to 18 mm Hg in diastolic pressure. Parkinson's disease. A 33-person pilot study from Washington University School of Medicine in St. Louis, published in Gait and Posture (October 2008), found that people with mild to moderately severe Parkinson's disease showed improved balance, walking ability, and overall well-being after 20 tai chi sessions. Stroke. In 136 patients who'd had a stroke at least six months earlier, 12 weeks of tai chi improved standing balance more than a general exercise program that entailed breathing, stretching, and mobilizing muscles and joints involved in sitting and walking. Findings were published in the January 2009 issue of Neurorehabilitation and Neural Repair. Falling down.Tai chi is especially useful for improving balance and preventing falls - a major concern for older adults. Studies have shown tai chi to significantly reduce falls in seniors by improving balance, awareness, mobility and confidence. It can also improve balance in people with neurological problems. A recent study in The New England Journal of Medicine found Tai Chi to be particularly effective for balance in people with Parkinson?s disease. Tai chi helps improve balance because it targets all the physical components needed to stay upright - leg strength, flexibility, range of motion, and reflexes - all of which tend to decline with age. To cut a long story short, Tai Chi is about the best health promoting exercise a person of advancing years can do. The key to getting the most from it is patience and regular practice. Even just 15 minutes a day will have a significant effect over time!